Making sure faces are hidden is an obvious solution when identities can’t be shown. One area of photography which can really give clients the jitters is the use of children in promotional and editorial materials, and rightly so. Extra care should be taken when featuring people under the age of 18 in corporate communications, but this doesn’t mean they have to be invisible or horribly pixelated to disguise identity. In some areas I do feel protection can be heavy-handed and overzealous. I particularly dislike the habit amongst local newspapers, and it’s a habit which seems to come and go with the tide, to only feature children’s first names or no names at all. Newspapers form part of our local history and are to some extent historical documents. A photo captioned simply with “James wins the 100m swimming competition” is pointless and silly. James has a surname and deserves recognition for his achievements just the same as any adult, but I won’t labour the point here. What I want to focus on instead is how I get around issues of keeping youngsters’ identities safe where it is necessary to do so while still fulfilling the brief and communicating some kind of narrative. My approach will vary according to the situation, the brief and age of the children. I sometimes have to account for special behavioural needs which will again guide my approach, but in any case there is always a way to take interesting, well-composed, properly lit photos which show the client at their best and respect the dignity of the youngsters involved. 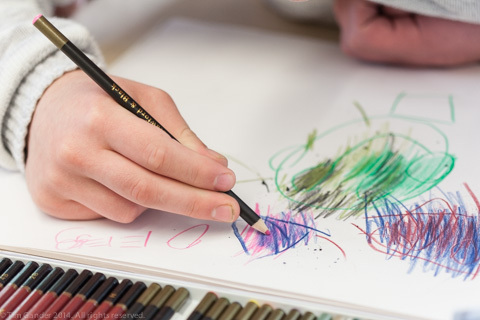 One important thing to remember is that if children are identifiable in something which is to be used to promote a business or organisation, permissions will be needed and care taken about how images are used. 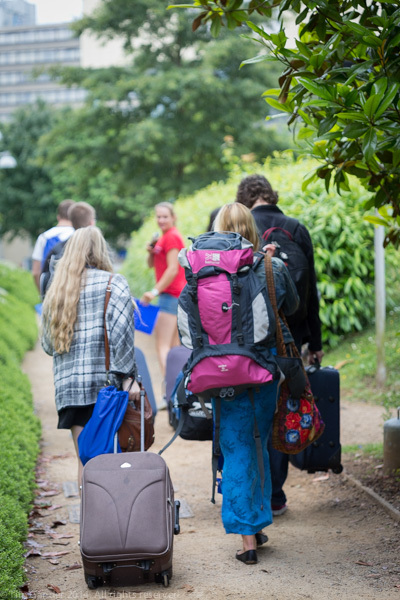 I will always liaise with my clients at the briefing stage as to the requirements and limitations of a photo session involving minors, and there’s nothing like good old common sense to make sure everything goes smoothly before, during and after the event. 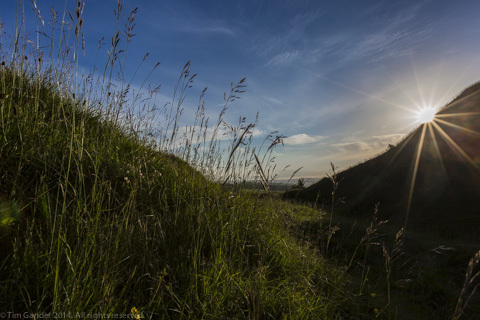 Cley Hill is a favourite area for me to walk. I find detail shots work better than trying to capture the whole thing, which always ends up looking like a small pimple in the landscape. It’s quite possible I’ve mentioned here and there that while my main photographic work concentrates on taking pictures for businesses and publications, I don’t try to fill diary gaps with weddings. I repeat I DON’T DO WEDDINGS. I believe in concentrating on what I do best, marketing my strengths and leaving my weaknesses to those who can fulfil those tasks better than I. But weddings aren’t the only discipline I don’t cover. I haven’t shot sport in several years. I used to do a fair bit of football for the Mail on Sunday when I lived in Portsmouth. I can’t say I enjoyed it especially, not helped by my general disdain for football, and I’d certainly never claim I got to be anything as good as any of the top sports photographers in the land, but I turned in good quality results on deadline and even got the occasional exclusive. I covered Wimbledon a couple of times, but really I think it’s best these things are left to people who have the experience and the passion to turn in stunning results time after time. Otherwise, I’m just another person with a camera clogging up the photographers’ pit. If there is one area I wish I was better at, and which I really need to give myself a kick up the arse to do more of, it has to be nature and landscapes. Not because I expect these to be an important part of my business in the sense of making a living from them, but because on the odd occasion I get to take such images, I enjoy the challenge and sometimes the results. One thing which is true of all good (or great) photography is that it’s not the camera or any of the other fancy equipment, but the eye, experience, foresight, passion and determination of the wetware behind the eyepiece (the photographer) which makes it great. Now I’m setting myself a goal; I may never be a ground-breaking landscape photographer, but I’m going to try harder to get out there, shoot landscapes and find a style and an angle which pleases me, which might also inform my corporate work and which might actually please others too. You never know, it might become a respected body of work, but I appreciate that might have to happen posthumously. I wonder if anyone fancies forward-dating a cheque for the first million-pound image I sell after I die? Bizarrely, having written in my last blog post about the Pine Range fire which I covered for The Bath Chronicle in 1991, I was heading back to my flat from a family gathering on Sunday evening to discover the sheltered housing complex on the opposite side of my building from where Pine Range once stood was surrounded by fire crews, engines and hoses. 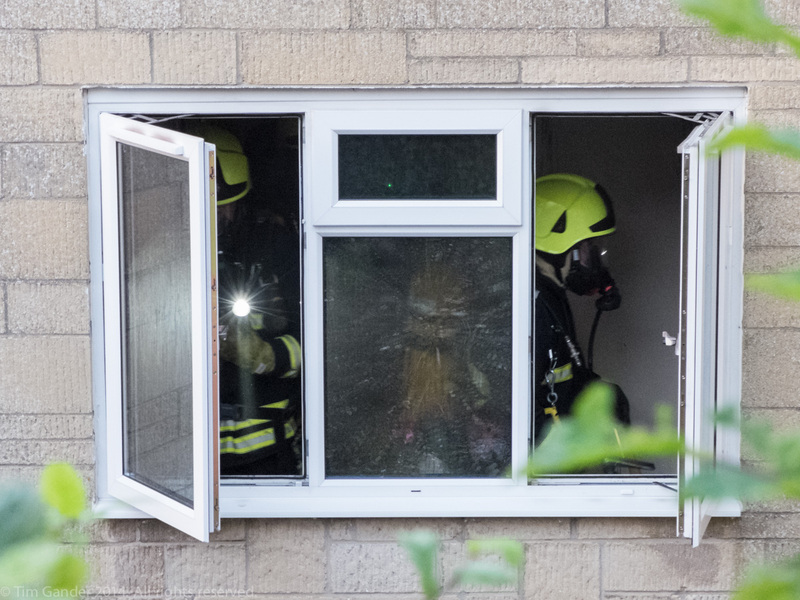 A fire had broken out in one of the flats and 11 residents had to be evacuated, with one resident being taken to hospital suffering smoke inhalation. Aside from the obvious concern that everyone had been evacuated safely I couldn’t help feeling I should take a few photos, in spite of the fact I had a fair number of other commitments that evening, limited time and no obvious client for any photos I would take. But the news photographer blood which still courses through me was buzzing and telling me to get on with it and at least take a few frames to offer up to the local paper. More in hope than expectation; time was a paper would have torn my arm off at the elbow for a set of pictures from an event they couldn’t get to and would happily have paid for them. Times have changed so very much though. I don’t often find myself covering this kind of story any more. Most of what I do for publications is press release work, which of course doesn’t include things like un-planned fires. I had to pause and ask myself if it was still valid for me to take pictures at an incident if I don’t have an immediate client for the shots. I don’t even carry a National Union of Journalists card any more, having let my membership lapse some years ago. I honestly don’t think any of that matters though. Whether or not a newspaper wants to use my photos is entirely their call. As a trained, experienced news photographer I still feel I have a duty to record events if I am able. I can’t know at the time of taking a photo whether I will have captured something banal, tragic or incredibly newsworthy. All I can do is call on all my training and experience and get on with taking pictures. Now that local newspapers no longer cover local stories and events with anything approaching enthusiasm perhaps it’s more important than ever that photographers with the right training and skills create quality visual records of what they witness. Looking at the paltry photographic coverage the Bath Chronicle gave the Tour of Britain last week, and The Frome Standard’s belated attempt at photographing a major news event on their own doorstep (their photos were taken over three hours after the event), it’s possible that historians of the future will look back on the stories of our time and wonder why the photos from the early 2000s are worse than the ones taken a century before on far more primitive equipment. 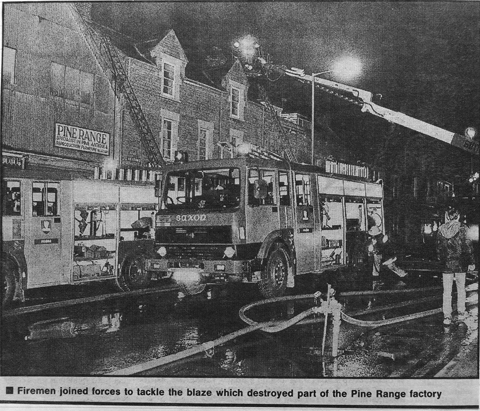 Sometimes I like to pull something from my archive and share it with you, so here’s a photo from February 1991 showing the Pine Range furniture factory in Frome being attended by fire crews as it’s gutted by fire. I apologise for the quality of the reproduction here, it’s an old newspaper cutting and I no longer have access to the original negative – a common occurrence of my very early work which is held by The Bath Chronicle (more likely the negatives no longer exist). I vaguely recall the circumstances surrounding this call-out. I was a freelance at “The Chron” at the time and I was probably working late, printing the day’s shoots ready for the next day’s paper, when a reporter came into the photography department to see if a photographer might be around to attend a breaking story. Luckily for them, I was. 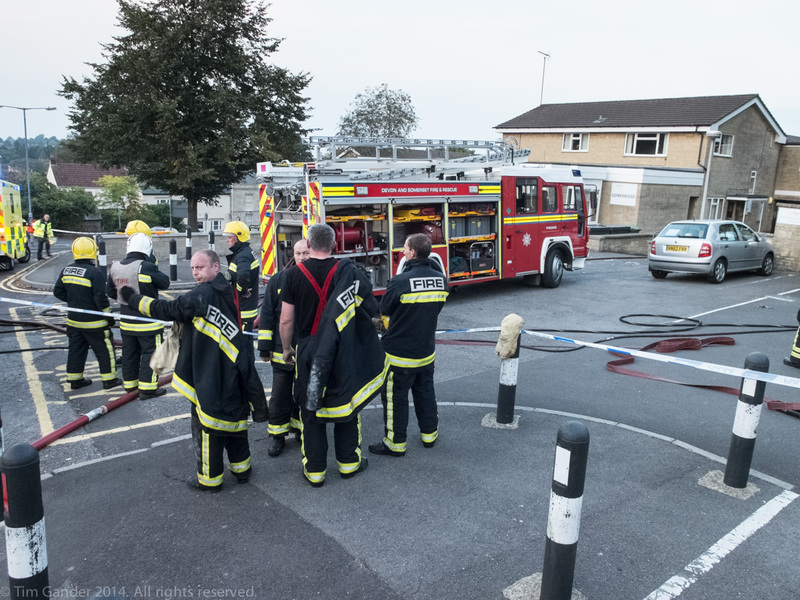 The story had come through of a big fire in Frome, so we headed out in my car (to be pedantic, probably my then-girlfriend’s car) to see what was up. I know it was late at night, might even have been around midnight, when we got there to find a few fire crews in attendance at the building which was billowing smoke. It was such a bitterly cold night that the run-off water from the fire hoses was freezing to the road, and I recall struggling to walk up the incline to the scene because of all the ice under foot. There wasn’t a huge amount to photograph, I just had to make sure I got the building and fire engines to fill the frame. After taking a few different angles, I was pretty much finished. There wasn’t much light about, and I recall using my large hammerhead Metz flashgun to illuminate the entire scene. It was hardly a moment for great art, but I would have headed back to the Chronicle offices straight after to process my film and make some prints so the picture desk could choose one for the paper the next morning. I probably rolled into bed in the early hours and would have been back on duty about half eight the next day. One small coincidence of this job is that from where I currently live my living room window overlooks the site of the Pine Range building, which was subsequently demolished and is now a block of flats. Hardly Circle of Life stuff, but curious all the same.